There are two bathing styles that are unique to Kusatsu. They are jikan-yu and yumomi and open-air baths (soto-yu), an essential part of daily life. They are both part of Kusatsu's longstanding traditions. 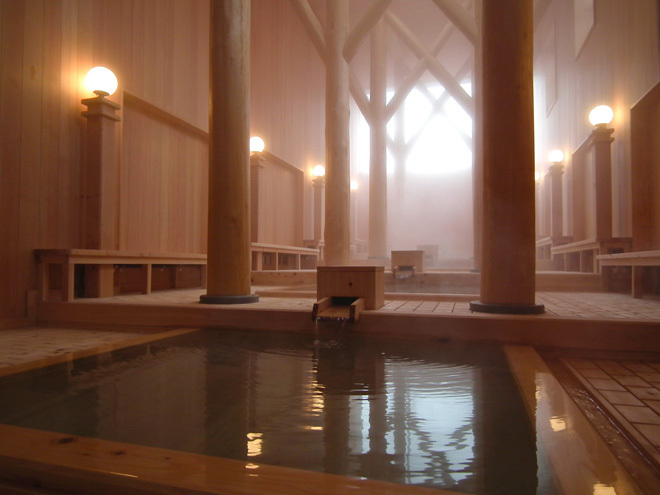 Here, we will introduce you to the Kusatsu bathing style. Please take this opportunity to understand its meaning and importance, which will help you thoroughly enjoy one of Japan's treasured hot springs. Before starting jikan-yu, bathers face a small indoor shrine and pray. This historical Japanese practice has become part of the jikan-yu method. While paying homage to the shrine bathers pray that their bodies may enter a rejuvenated state that will readily accept treatment while bathing. 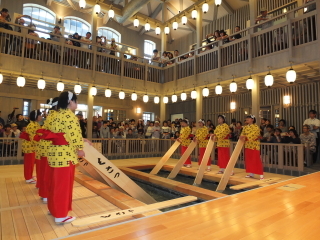 At Kusatsu Onsen, a traditional method called jikan-yu is employed when taking the bath. At about 65 degrees Celsius, Kusatsu's spring water is too hot for bathing. So in order to make it possible to bathe in the water, the bathwater is stirred with long　planks to cool it to an enterable 48 degrees. This act of stirring the water is called "yumomi." Even at 48 degrees, yumomi makes it possible to bathe comfortably in the water. Normally water at this temperature is too hot for bathing. However, because of the high quality and concentration (acidic due to hydrogen sulfide) of the water here at Kusatsu Onsen, it is possible to take a bath at this temperature. In addition to this, when the water is hit with the sun's rays and mixes with the air, it crystallizes into Kusatsu's "yunohana," a natural bath salt. The water continually mixes with air during yumomi, which allows for the creation of lots of yunohana, raising the concentration of the water even further. Yunohana are microscopically dispersed throughout the water, and when people enter the bath they create a thin membrane around their bodies, which makes the water feel cooler to the touch. In this way the water feels especially "soft," which is why the water is of a different class than water that has simply been cooled. This method of lowering the water temperature also serves as an important pre-bathing exercise. In addition, breathing steam into the body also has therapeutic effects. Everyone sings a special song at this time, which further stimulates deep breathing, adding to the absorption of steam and healing effects of yumomi. To prevent anemia or a rush of blood to the head when a bather enters the water, as well as to increase blood circulation in the head, bathers cover their heads with towels and repeatedly pour water over the back of their heads. The cerebellum, which regulates the body's temperature, is in the back of our heads, so when we dilate the head's blood vessels the rest of the body's blood vessels also widen, which prevents dizziness or fainting from taking a bath. The pores in our skin also open up, strengthening the effects of the bath. A towel placed on top of the head is used simply to stop the water from　getting into our eyes and ears. While relaxing in the water, the bath leader will always calls out a set of orders to the guests. Replying to these makes everyone breathe more deeply, thus improving the healing effects of the bath. After many years of research, three minutes in 48 degree water has been found to be the safest, most effective method of bathing. After bathing, be sure to drink fluids. Drinking something cold will result in the whole body getting cold, so please drink something warm such as tea. And please take a relaxing rest after the bath. Cooling down in the wind or with a fan is not advised. After getting out of the bath, bathers can opt to get a steamed towel for a small fee. In the 5 minutes after putting this towel on their heads, sweat will gush out of their bodies like a waterfall. This sweating out is important, as it improves all of the good effects of the bath. 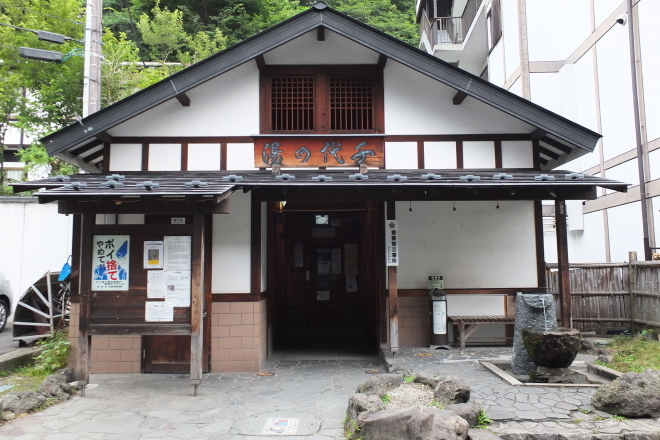 Rather than opening a window and cooling off, fanning oneself, or wiping off the sweat with a towel, wrapping the body in a steamed towel right after getting out of the bath, sitting down and sweating everything out is the way of Kusatsu Onsen. You can experience "Jikanyu," Kusatsu Onsen's traditional bathing style! *When these days off fall on a national holiday, the bathhouse may be closed on another day of the week. Admission tickets on sale at Chiyo-no-Yu.